The European Venus Explorer (EVE) mission described in this paper was proposed in December 2010 to ESA as an ‘M-class’ mission under the Cosmic Vision programme. It consists of a single balloon platform floating in the middle of the main convective cloud layer of Venus at an altitude of 55 km, where temperatures and pressures are benign (∼25°C and ∼0.5 bar). The balloon float lifetime would be at least 10 Earth days, long enough to guarantee at least one full circumnavigation of the planet. 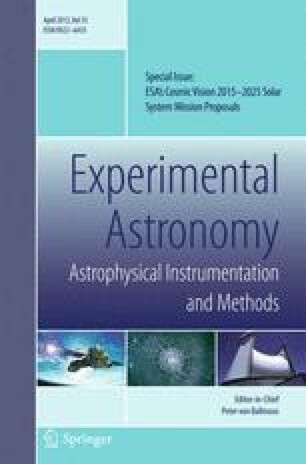 This offers an ideal platform for the two main science goals of the mission: study of the current climate through detailed characterization of cloud-level atmosphere, and investigation of the formation and evolution of Venus, through careful measurement of noble gas isotopic abundances. These investigations would provide key data for comparative planetology of terrestrial planets in our solar system and beyond. A full listing of the 220+ members of EVE team is included as Appendix. The EVE science team thanks the CNES and Astrium teams who worked on the mission study. We acknowledge financial support from our national funding bodies including CNES (France) and STFC (UK). The full EVE team is: M. Bentley, M.G. Firneis, J.J. Leitner, K. Schwingenschuh (Austria); O. Karatekin, P. Rosenblatt (Belgium); J. Whiteway (Canada); E. Villard (Chile), J.M. Merayo, J. Merrison, S. Vennerstrom (Denmark); M. Aittola, E. Kallio, P. Kostama, G. Molera, J. Raitala, T. Törmänen (Finland), P. Allemand, J.-J. Berthelier, B. Bézard, J. Blamont, E. Chassefière, B. Christophe, T. Cours, P.-R. Dahoo, P. Drossart, G. Durry, F. Forget, M. Ghysels, L. Gomez-Martin, M. Hirtzig, L. Joly, F. Leblanc, S. Lebonnois, E. Lellouch, A. Määttänen, B. Marty, H. Massol, D. Mimoun, F. Montmessin, M. Moreira, G. Occhipinti, P. Rannou, J.-C. Sabroux, Ph. Sarda, E. Seran, C. Szopa, P. Touboul, J.G. Trotignon, T. Widemann (France); G. Arnold, H.U. Auster, J. Flohrer, L. Guicking, P. Hartogh, J. Helbert, J. Oberst, M. Pätzold, S. Tellmann, T. Tokana, J. Woch (Germany); L. Bodnar, Cs. Ferencz, J. Lichtenberger (Hungary); G. Bellucci, S.F. Colosimo, F. Ferri, D. Grassi, G. Komatsu, A. Migliorini, E. Palomba, G. Piccioni, S. Stefani (Italy); T. Imamura, I. Murata, K. Noguchi, M. Taguchi, M. Takahashi, Y. Takahashi, Masay. Yamamoto, Masar. Yamamoto (Japan); D. Luz, M. Roos (Portugal); N. Barri, A. Basilevsky, D. Belyaev, Z. Cheremukhina, G. Dolnikov, D. Duev, A. Ekonomov, A. Federova, A. Gavrik, M. Gerasimov, K. Grechnev, A. Grigoriev, M. Gritsevich, T. Gudkova, N. Ignatiev, M. Ivanov, I. Khatuntsev, O. Korablev, L. Ksanfomality, S. Linkin, A. Lipatov, I. Lomakin, A. Lyash, B. Maiorov, M. Marov, S. Maximenko, V. Mikhailov, I. Mitrofanov, B. Moshkin, A. Rodin, N. Sanko, A. Shakun, A. Skalsky V. Smirnov, V.P. Stulov, S. Svertilov, I. Vinogradov, L. Zasova, L. Zelenyi (Russia); J. Lopez-Moreno, I. Lòpez, F.J. Martin-Torres, G. Molina-Cuberos, A. Sanchez-Lavega (Spain); S. Barabash, J.-E. Wahlund, M.-H. Weng, C.M. Zetterling (Sweden); K. Altwegg, J.-L. Josset, J. Whitby, R. Wieler, P. Wurz (Switzerland); G. Cimò, P. Fridman, L. Gurvits, S. Pogrebenko, D. Stam (Netherlands); K. Aplin, A.D. Aylward, C.J. Ballentine, S.J. Barber, A. Bargery, N.E. Bowles, H. Busemann, S.B. Calcutt, A.J. Coates, C. Cochrane, C. Cockell, D. Cullen, L. Dartnell, G. Dorrington, G.W. Fraser, M. Galand, R. Ghail, A. Griffiths, P. Grindrod, A. Horsfall, C.M. Juanes-Vallejo, S.P. Kelley, M. Leese, S.R. Lewis, A.D. Morse, I. Mueller-Wodarg, M. Patel, E. Sawyer, M. Schonbachler, S. Sheridan, M.R. Sims, K. Smith, D. Talboys, N. Waltham, M. Warner, C.F. Wilson (U.K.); S. Atreya, K.H. Baines, T. Balint, D. Banfield, M.A. Bullock, J. Burke, B. Campbell, G. Chin, D. Crisp, N. Dauphas, G.T. Delory, L.W. Esposito, J.M. Forbes, P. Gierasch, C. Goldblatt, R.E. Grimm, D. Grinspoon, E. Heggy, A. Ingersoll, N.R. Izenberg, V. Kerzhanovich, V. Krasnopolsky, M. Kreslavsky, W.S. Kurth, S.S. Limaye, R. Lorenz, J. Luhmann, P. McGovern, A. Nagy, K. Nock, A. Pankine, R. Pertzborn, S.C.R. Rafkin, N.O. Renno, C.T. Russell, D. Schulze-Makuch, M. Smith, S. Smrekar, E.R. Stofan, C.C.C. Tsang, R. Yokochi (U.S.A.).